February 22, 2011 is "Texas for Illinois Day" to Repeal the Death Penalty! Today February 22, 2011 is "Texas for Illinois Day" to Repeal the Death Penalty! 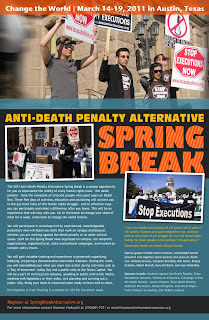 The dates for this year’s Anti-Death Penalty Alternative Spring Break are March 14-18, 2011. You can register by clicking here. Now is an important time in the fight to end the death penalty. After 11 years of a moratorium, Illinois may soon abolish the death penalty if the governor signs the abolition bill he has been sent. 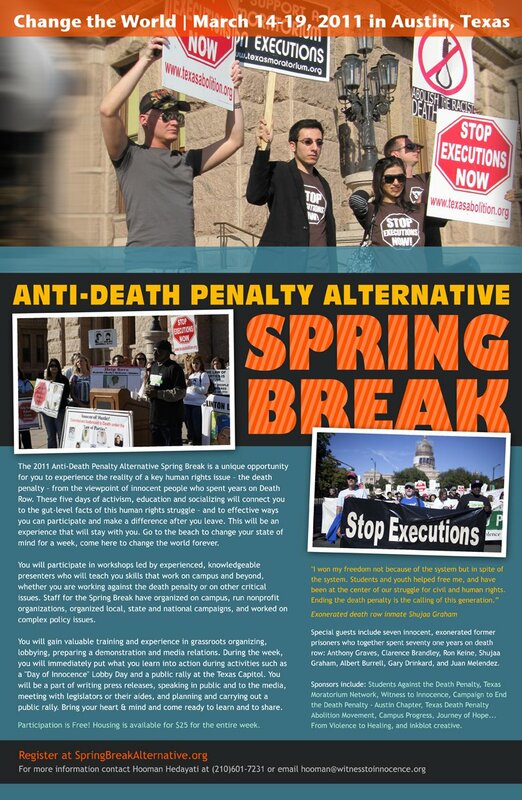 Attend our alternative spring break and help us end the death penalty in Texas – the number one execution state in the United States. The event includes a statewide “Day of Innocence” Lobby Day and Rally Against the Death Penalty on Thursday March 17 at 5:30 at the Texas Capitol. We are excited about this year’s program (see schedule here), which includes attending the World Premiere at the SXSW Film Festival of a new documentary about the Todd Willingham case, plus great panelists including several people exonerated from death row, such as Anthony Graves who was released in October 2010 after 18 years on death row in Texas and Clarence Brandley who spent ten years on death row in Texas before proving his innocence. Other speakers include Sam Millsap, a former elected District Attorny in Texas who now opposes the death penalty because he believes an executed person named Ruben Cantu whom he prosecuted may have been innocent. We will provide participants with workshops led by experienced, knowledgeable presenters who will teach them skills that they can use to go back home and set up new anti-death penalty student organizations or improve ones that may already exist. The skills participants will learn can also be used in other issues besides the death penalty. Students will gain valuable training and experience in grassroots organizing, lobbying, preparing a public rally and media relations. During the week, students will immediately put what they learn into action during activities such as a Death Penalty Issues Lobby Day and a public rally at the Texas Capitol. There will be opportunities to write press releases, speak in public, meet with legislators or their aides, and carry out a public rally. In your free time, Austin has a lot to offer for fun, including the SXSW film, music and interactive festival that takes place the same week as our alternative spring break. Anti-Death Penalty Alternative Spring Break is a program of Students Against the Death Penalty, Texas Moratorium Network, Texas Students Against the Death Penalty, Campaign to End the Death Penalty – Austin Chapter, Texas Death Penalty Abolition Movement, Texas Death Penalty Education and Resource Center. Co-sponsors include Campus Progress, Witness to Innocence , Amnesty International, and Journey of Hope … From Violence to Healing.